The Lion and The Unicorn is a short film inspired by the heraldic symbols found on the Royal Coat of Arms of The United Kingdom, the lion (representing England) and the unicorn (representing Scotland). The piece uses representations of both alliance and opposition to explore national identity within the context of the 2014 referendum on Scottish independence. 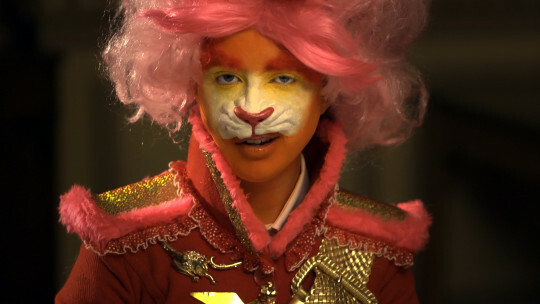 The video features three recurrent characters: the lion, the unicorn and the queen. These figures seem to emerge from disparate genres, including shadowy historical reconstruction, playful nursery rhyme and pragmatic TV interview. Inhabiting the rich historical setting of Traquair House in the Scottish Borders, they are seen drinking North-sea oil from Jacobite crystal, dividing up the pieces of a Union Jack cake and inciting conflict over the mispronunciation of Robert Burns. A transparent, flexible plastic material, usually of cellulose acetate or polyester, on which light-sensitive emulsion is coated, or on which an image can be formed by various transfer processes. A medium in which ground pigments are mixed to produce a paste or liquid that can be applied to a surface by a brush or other tool; the most common oil used by artists is linseed, this can be thinned with turpentine spirit to produce a thinner and more fluid paint. The oil dries with a hard film, and the brightness of the colour is protected. Oil paints are usually opaque and traditionally used on canvas. Images recorded on videotape or on optical disc to be viewed on television screens, or projected onto screens. The medium through which these images are recorded and displayed. © 2014 British CouncilThe United Kingdom’s international organisation for cultural relations and educational opportunities.